There's magic of a sort when art responds to actuality by creating a new representation of it; in doing so, the artist can remap that supposedly 'set' actuality and allow us to see and/or know in new ways. Thanks to Stan Douglas' "Abbott & Cordova, 7 August 1971" and Jeff Wall's "Mimic," for instance, I cannot pass by brick storefronts or flat warehouse buildings in the older parts of Vancouver without seeing the elaborately composed scenes captured by those photographers. Staged scenes? Yup. Bring history to life? That too, as much as it's possible. Similarly, Michael Christie's superb stories in The Beggar's Garden continue to give me pause. His astute evocations of place (Vancouver's downtown east side in particular) and people (like the woman who runs a thrift store in "The Queen of Cans and Jars" and the man in "Discard" making contact with his down and out grandson via food proxies) spring to mind each and every time I walk along Vancouver's bad reputation streets wearing the habitual default face of the middle class urban dweller—psychically retracted and determined to make no contact—and inspire me to look beyond my own set of 'known facts' that might really be nothing more than prejudiced acceptance of stereotypes. This weekend when hubby and I were walking around Victoria (re: blustery, damp, cold, grey), looking at the historic photographs scattered throughout the Empress—FDR visiting; John Wayne, a frequent guest; and so on—and taking the ferry to and fro, Yasuko Thanh's story of a Chinese man with leprosy exiled to D'Arcy Island just off the southeast coast of Vancouver Island encouraged me to think about stories rarely told or completely brushed aside. As a tourist mecca, Victoria of course aims to sell a skewed vision stitched together from arbitrary facets of Olde Tyme Englande—bag pipes, double-decker busses, high tea, candy shoppes, bucolic prettiness, etc. Implied too: harmoniousness since forever. Even the totem poles sprouting up in parks and green spaces by museums suggest an extended history of mutual understanding and working together for the common good. Colonialism rendered quaint. In Thanh's story a medical officer from Victoria visits a leper 'colony' that is in fact a bare-bones internment camp where immigrant lepers were exiled (so to protect the non-leper population). The place is not a comfortable hospital. Nor does it come close to being a care facility or a sanitarium. 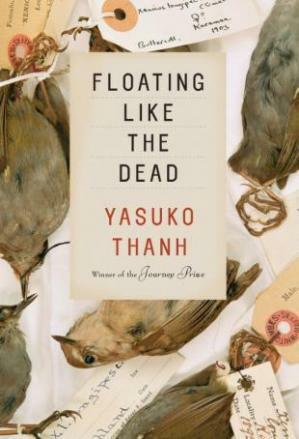 Thanh's story is a subtle evocation of time and place; the author doesn't soapbox about inequality or racism because the (actual) historical setting speaks for itself. And Thanh artfully meditates on that setting. Two other stories in Floating Like the Dead are set in tourist towns, one in Mexico and the other in Honduras. The stories feature women who travel far (from Canada, from France) for love or to find themselves (or both). In both too the dream of travel and starting over is complicated by an unavoidable fact: the imagined destination and the real one are hardly the same. What's more, the dream of remaking yourself—somewhere else you become somebody else—conveniently forgets another fact: that baggage called personality. While "the road to hell is paved with good intentions" is tired (but true), Thanh's brilliant exploration of the theme is such that when I'm in a Mexican tourist town next month, I can safely predict that when I catch sight of a tourist woman who's running a small hotel, it's Thanh I'll be thinking of.